The dense ruby/purple-colored 2003 is surprisingly fresh and crisp, displaying no signs of the vintage's extreme heat. This full-bodied, powerful, rich, backward, dense, tannic effort reveals notes of Chinese black tea, creme de cassis, licorice, and melted chocolate. Give it 4-5 years of cellaring, and drink it over the next two decades. Tasted at Bordeaux Index’s “10-Year On” tasting in London. 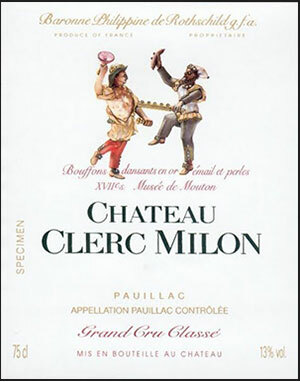 The Clerc-Milon ’03 is very different to the d’Armailhac ’03, perhaps crisper and more classic, with cedar and autumnal leaves. It coalesces nicely in the glass and is actually very attractive. The palate is medium-bodied with fine tannins, crisp acidity and a commendable sense of focus. I appreciate the classicism of this Clerc-Milon, a sense of reserve on the finish, which is in stark contrast to the more flamboyant d’Armailhac. This is just lovely – perhaps a hidden gem of the vintage? Tasted March 2013. An opulent, raisin-tinged nose that is relatively backward, dense yet pure with well integrated new oak. The palate is plush, very pure with firm, sinewy tannins and excellent fruit concentration, with notes of blackcurrant, blueberry and a touch of vanilla. A solid, classy wine. Drink 2009-2015. Tasted January 2007. Loads of licorice and currants follow through to a full-bodied palate, with lots of refined tannins and a long, long finish. This is very structured and layered. Beauty. Better than the 2000. Best after 2010.